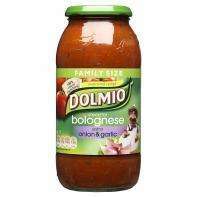 Dolmio Family Size Bolognese Sauces, large 750g jar. Varities include original, light, extra onion and garlic, extra mushroom and spicy. Orignal/light was £2.35, the other varities £2.49 so better than half price. Currently £2.56 in Asda and £3.34 in Tesco and Sainsbury's so a good deal if you like spag bol.